Chase Your Dreams is the perfect home base for your next McCall vacation. This 4 bedroom, 2.5 bathroom home has plenty of room to spread out and will sleep up to 11 guests in beds. 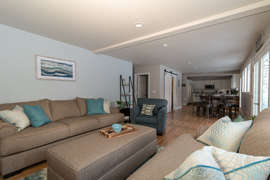 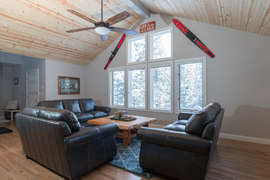 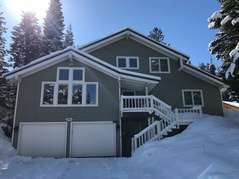 Located in a quiet neighborhood in the city limits no matter what you plan to do while on vacation in McCall everything is right outside your door. This extremely clean and well-equipped home will make you feel like you never left you own home and you may never want to leave! 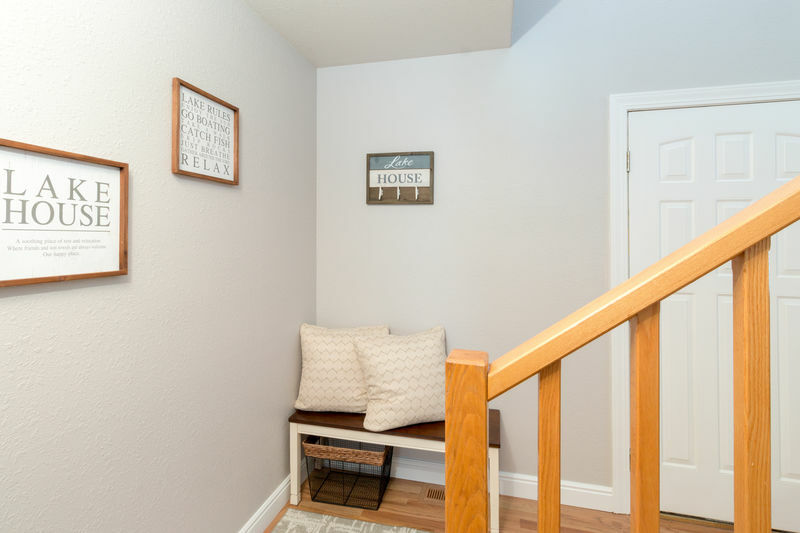 From the second you step in the door you will notice the owner’s attention to detail from the comfortable furnishings to the decorations and artwork. Cozy up in one of the three comfy leather couches in the family room, this is the perfect place to spend some quality family, unplugged time. Play a game or just sit and gaze out the windows at the beautiful trees throughout the neighborhood, you might even see some wildlife. 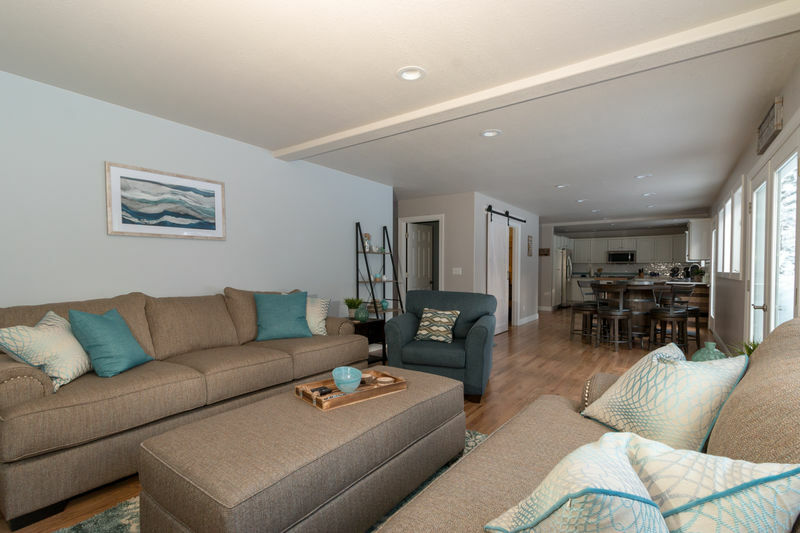 For those looking to plug in the living room is the place for you. 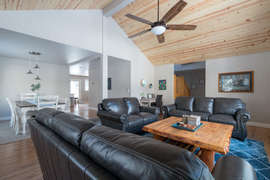 There is cable television and plenty of DVD’s to keep everyone entertained, there is even an Amazon Dot for your listening enjoyment. If that is not enough the television is a Smart TV so you can login to your own Netflix or Amazon account, there is even a Play Station 4 but don’t forget to bring your favorite games. 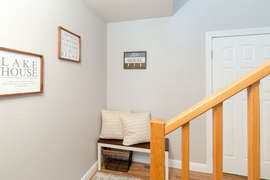 Of course, there is free Wi-Fi. 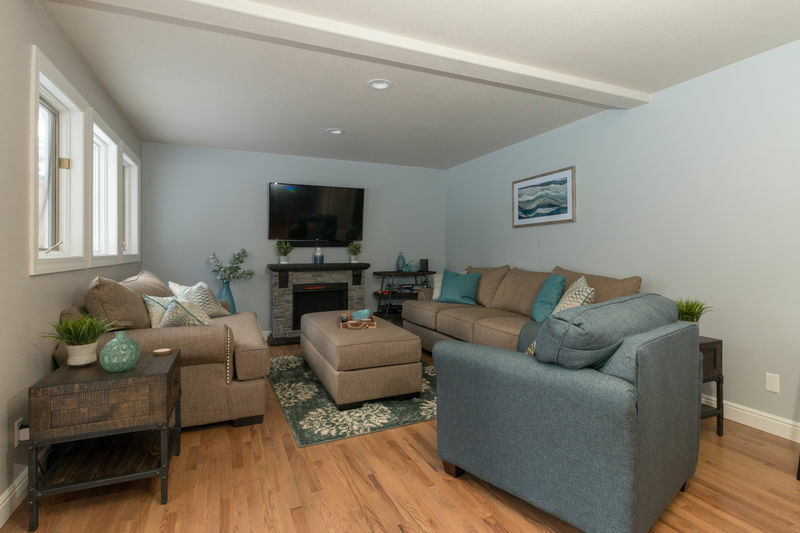 The electric fireplace in the living room will add a bit of warmth and ambiance on those cold winter evenings. For the cooks of the group no need to worry the kitchen is fully stocked for your cooking enjoyment. 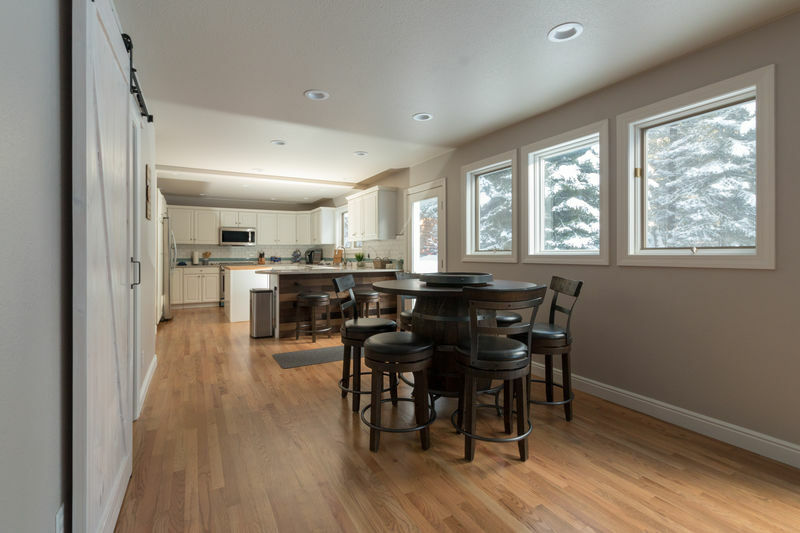 The spacious kitchen has everything you will need to cook the perfect meal at the end of an enjoyable day of playing in the McCall area. 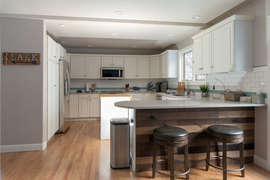 Once again you will feel like you never left home, there is plenty of pantry space to store your groceries so you don’t have to pile everything on the counter tops. The chef of the family will not be lonely as the kitchen flows seamlessly into the breakfast nook and living room. There is also a formal dining room with seating for 8 adjacent to the family room. 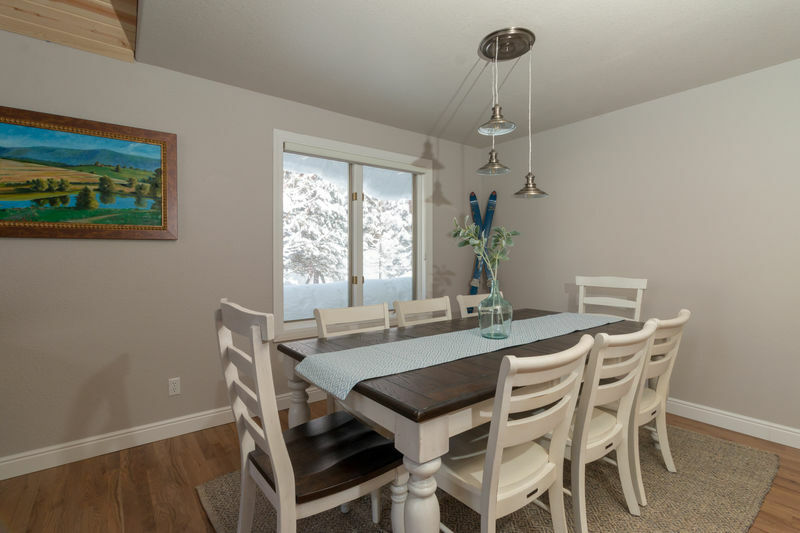 This is the perfect place for everyone to get together and enjoy a delicious meal. For those just looking to get a quick bite the whiskey barrel table in the breakfast nook is the perfect place, there is even a Lazy Susan at this table that makes sharing easy. 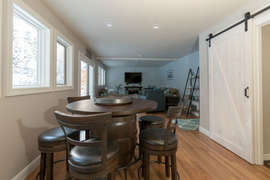 There are two bar stools at the end of the kitchen counter for those looking to keep the chef company in the kitchen. 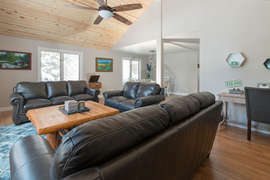 There is no shortage of amenities throughout the living area of this home, the outside does not disappoint either. 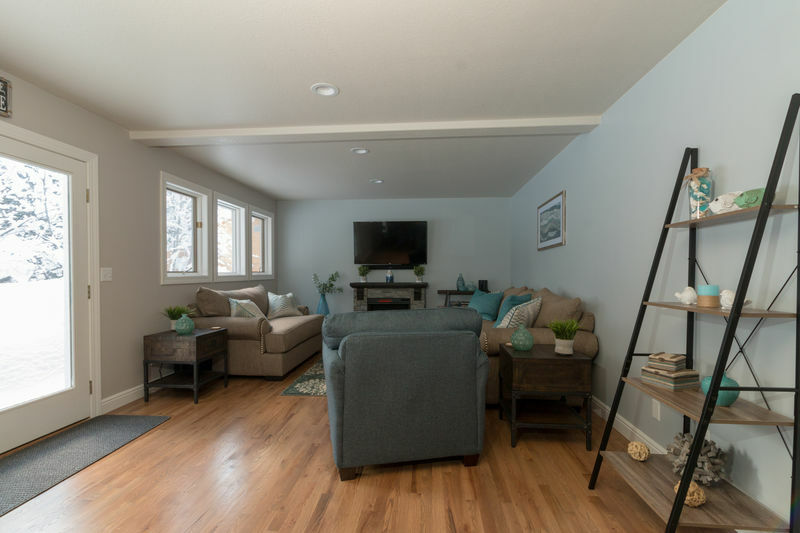 During the summer months you will appreciate the large deck and yard. Everyone will enjoy roasting marshmallows around the fire pit in the backyard. 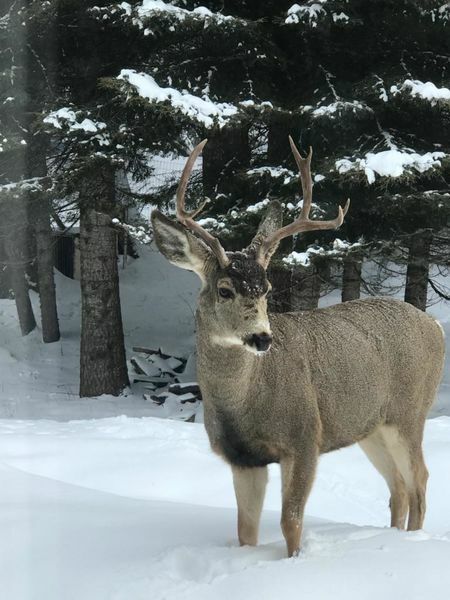 Please keep the noise down if it gets late as we like to be good neighbors. 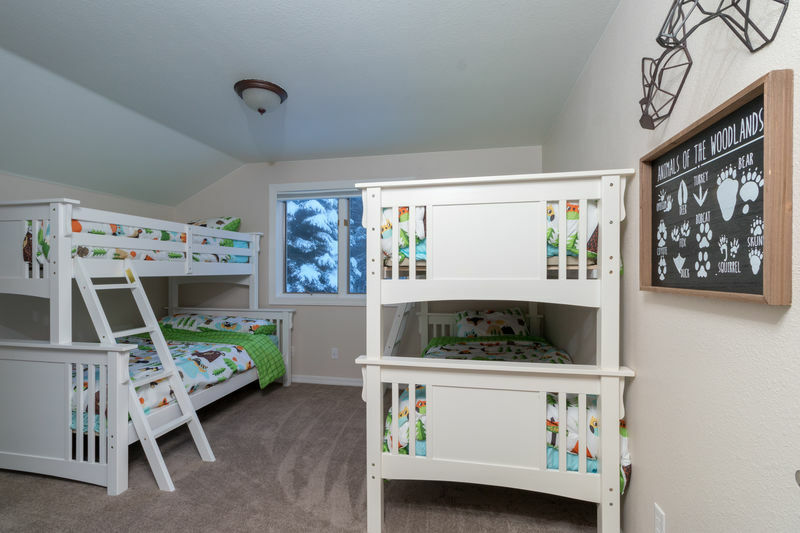 Chase Your Dreams has a plethora of sleeping options. The master bedroom features a luxurious king bed and fully updated bathroom with double vanity and tiled shower. 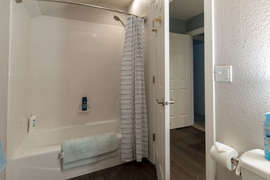 Just off the bathroom is a large walk-in closet with plenty of room to place your personal belongings during your stay. If you like to fall asleep or wake up to television there is a television in the master with cable. The rest of the bedrooms are on the upper level. The second bedroom features a beautiful queen log bed. 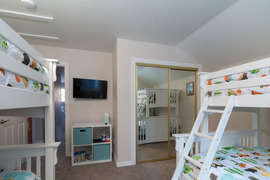 There is also a closet to hang your items during your stay. 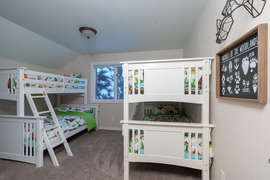 This is the perfect room for a family with one small child as there is a twin mattress under the bed that can be pulled out and slept on. 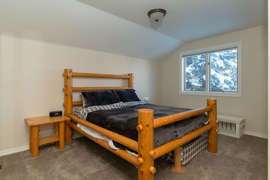 The rustic, log theme continues into the third bedroom with a large, beautiful king log bed and two unique log nightstands. 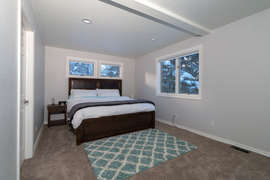 This bedroom also has a television for those that prefer to watch television in bed. The fourth bedroom will have the kids in awe!! This is the bunkroom where all the kids will want to be. 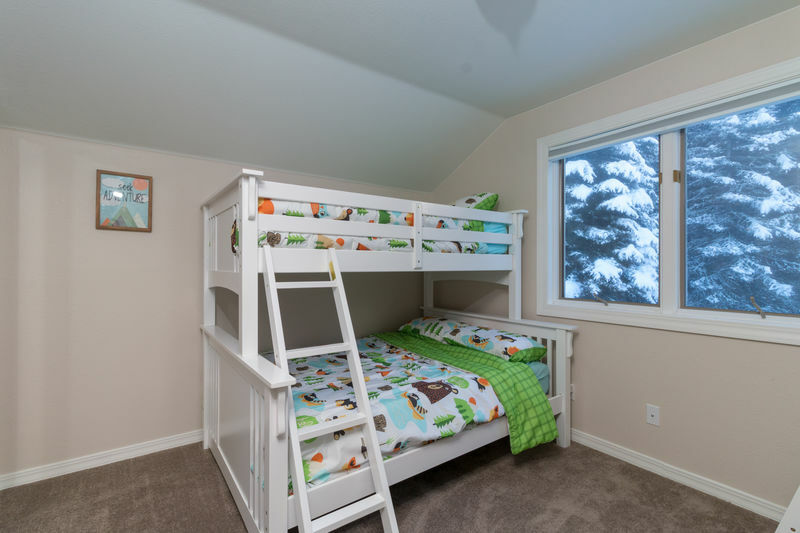 The wildlife themed bedding and pictures will have the kids up late into the night exploring. 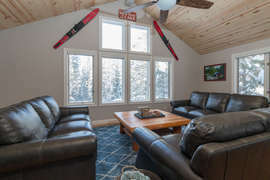 With a television, DVD’s and games you will know where all the kids of the group are. 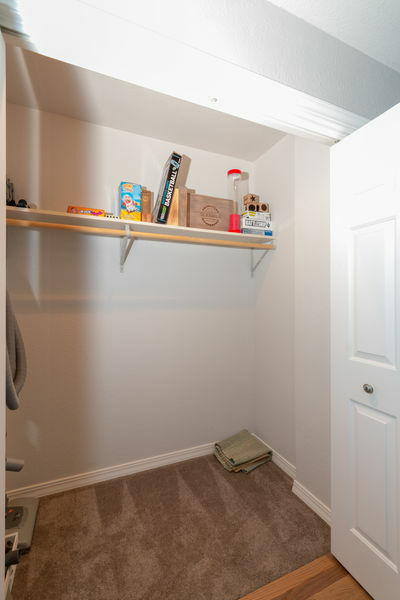 There is also plenty of room in the closet to store suitcases and keep the clutter down. 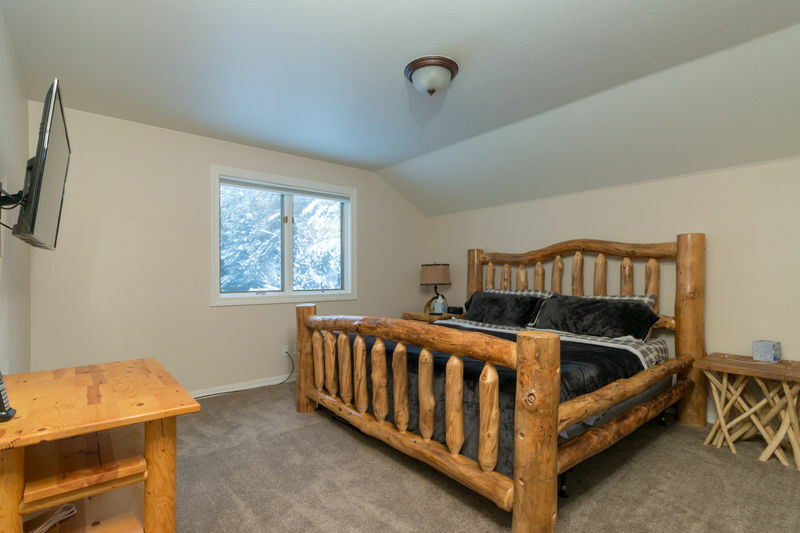 All three upstairs bedrooms share one large bathroom. 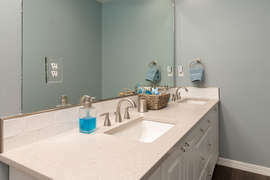 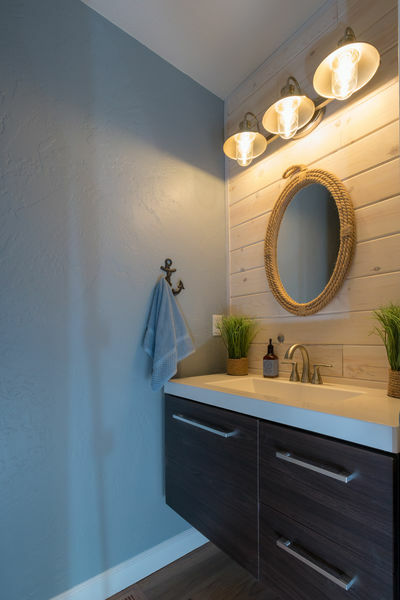 No need to worry the double vanity has plenty of room for guests to spread out and there is also plenty of shelf space in the bathroom. 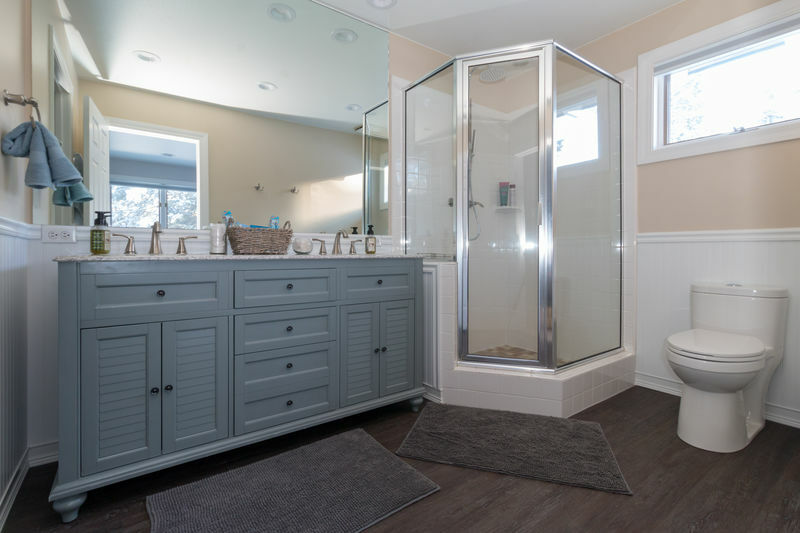 The tub/shower combo is separated by a door for added privacy while others can still utilize the sink and main part of the bathroom. 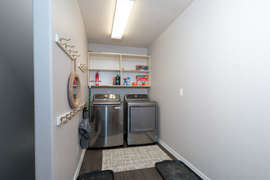 There is even a laundry shoot so you can send dirty laundry straight down to the laundry room. Yes, if things get a bit messy during your stay there is a laundry room with full sized washer and dryer. 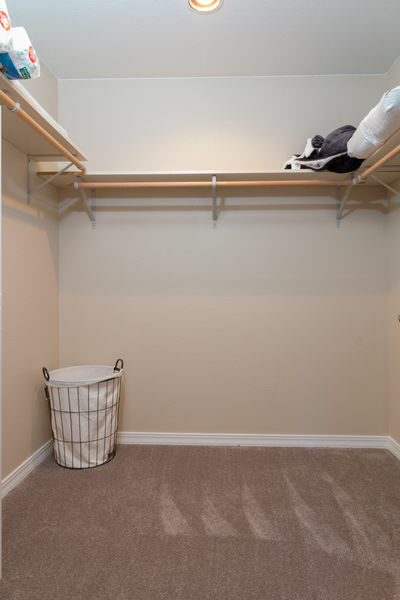 The laundry room also doubles as a mud room with a bench and plenty of room to hang wet jackets, pants, etc. 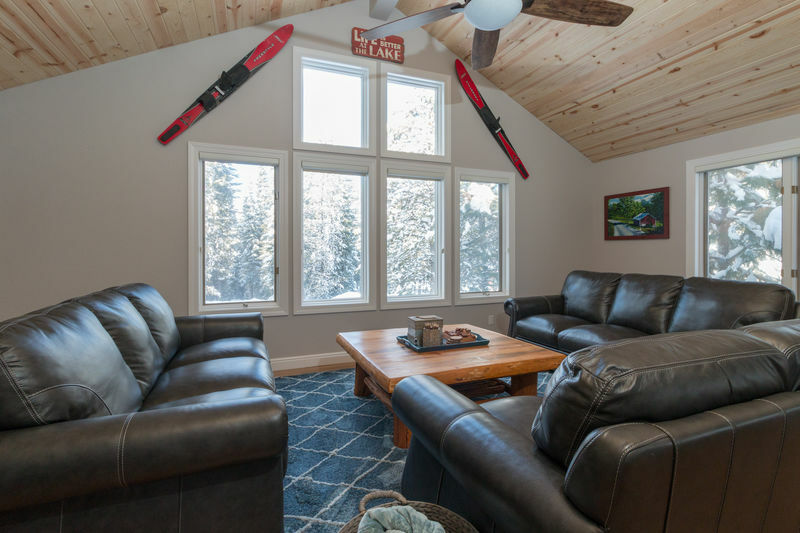 Downstairs there is a two-car garage to store your skis, and gear securely so you don’t have to worry about leaving them in your car during your stay. 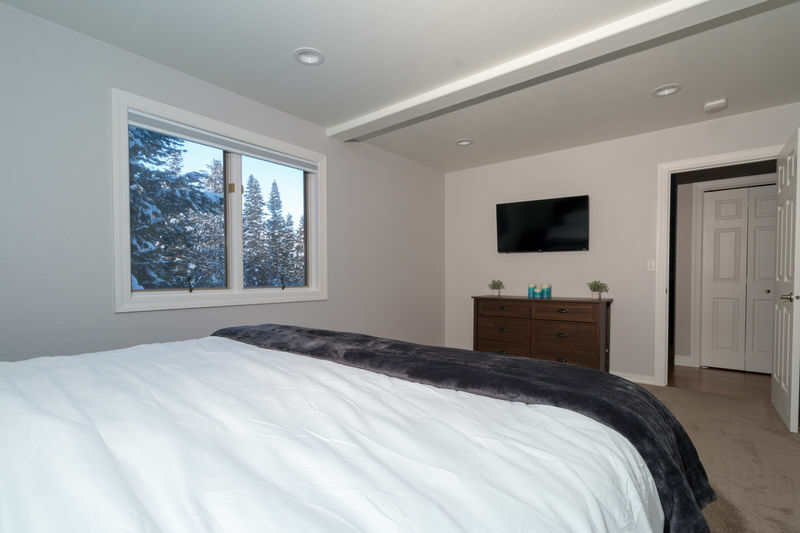 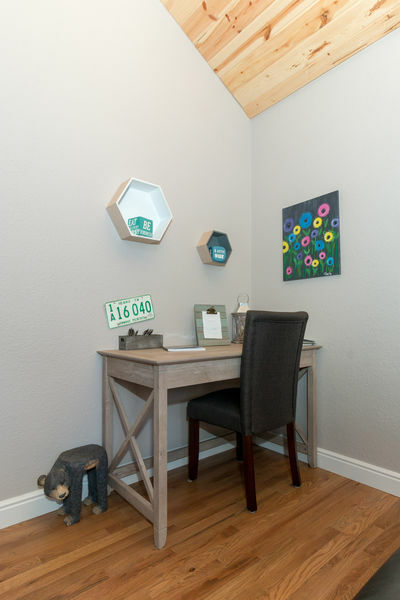 All and all Chase Your Dreams is the perfect McCall getaway for those looking to feel like they never left the comforts of their own home and want to be centrally located to everything that McCall has to offer year around.